Wow Christmas is already here! Our phone lines, emails and live chat are running hot as Dash Cam gift purchases have really ramped up. This year is particularly busy with customers seeking advice about which Dash Cam to buy that special someone (or to just spoil themselves with one). Dash Cams make a perfect functional, practical and exciting gift that the receiver will actually use. 9 out 10 times the Dash Cam will be installed and driven around before Christmas lunch is put on the table! With an increase in road rage, poor driving practices and lack of ownership on our roads, a Dash Cam makes a thoughtful gift that will provide a more reassuring drive in 2019. Both Dash Cams have outstanding build qualities, highest temperature resistance ratings, high 1440P QHD video resolution and best all round performance and reliability. BlackSys CH-200 – well priced, mid-range Dash Cam boasting dual 1080P resolution, dual Sony Exmor sensors and a quality build. Customer feedback all year has been very positive. BlackVue DR750S-2CH – premium Dash Cam model boasting dual 1080P resolution, the latest Sony Starvis sensors and a confident 2 year warranty. Lukas QVIA QR790-2CH – newly released, premier Dash Cam boasting 1440P QHD front resolution/5.5 MP front lens + the latest Sony Starvis sensor. This quality Dash Cam is produced by the well known Korean brand Lukas. The Lukas QVIA QR790-2CH offers extremely high temperature resistance, impeccable build quality and high end features. It also comes with heaps of inclusions. Look at the Vicovation OPIA 2 Dash Cam. The Vicovation OPIA 2 is Australian driver and fleet favorite. The BlackVue DR750S range is one of the most stylish Dash Cam range around. They look great in cars and blend in nicely with the exterior and interior of all cars. The new Lukas QVIA Dash Cam range are professional units with tidy builds and clean designs. BlackSys CH-200 – very popular mid-range Dash Cam boasting dual 1080P resolution, dual Sony Exmor sensors and a quality build. Customer feedback all year has been very positive. BlackVue DR750S-2CH – premium Dash Cam boasting dual 1080P resolution, the latest Sony Starvis sensors and a 2 year warranty. Lukas QVIA QR790-2CH – newly released, premier Dash Cam boasting 1440P QHD front resolution + the latest Sony Starvis sensor. The Lukas QVIA offers extremely high temperature resistance, impeccable build quality and high end features. The above 3 Dash Cams all do without a screen so can be connected via Wi-Fi to a smartphone. Through the manufacturer’s free APP, videos can be watched and camera settings can be changed. If you think the receiver would not want to operate Wi-Fi and would like a screen on their Dash Cam, take a look at the DOD LS500W-2CH. Great, user friendly dual model with a screen enabling the camera to be configured directly on the screen. The DOD LS500W-2CH is an affordable option that has the Sony Starvis sensor, highest 12800 ISO value, largest f/1.6 lens apertures for excellent video quality. Koreans make the best parking mode Dash Cams and all these Korean made models will record any motion or impact that occurs while parked. They have the all important pre-buffered recording in Parking Mode, which means the Dash Cam records footage both before and after either Dash Cam is triggered by either motion or impact (BlackVue = 5 second pre-recording. BlackSys and Lukas QVIA= 10 second pre-recording). The pre-buffered recording can help to see the important lead up to the incident while parked. Their respective hardwire kits or a battery pack are required to use this feature. All these Dash Cam models have a screen on the unit which makes them more user friendly and fuss free to operate. The LCD screens make for easy setup, easy menu access and easy video playback. Inbuilt Wi-Fi for connection to a smartphone to view footage and configure the Dash Cam settings. Both BlackVue and Lukas QVIA have intuitive smartphone Apps and PC viewers to configure settings and watch Dash Cam footage. Both units are small, affordable and have Sony Exmor Sensors for great video quality. For a front and rear recording Dash Cam you can’t go past the BlackSys CH-200. The BlackSys CH-200 has most features seen in Dash Cams twice its price. This Dash Cam model records the road ahead and inside the cabin. The footage can record unruly passengers and protect the receiver from false passenger accusations. This DOD camera is specifically designed for motorbike riders who want to protect themselves on the road with video evidence, while enjoying their ride. The DOD Sony STARVIS range (RC500S & LS Series Dash Cams) produce the best nighttime video quality on the Dash Cam market. Coupled with the Sony STARVIS sensor, the range contains the largest f/1.6 lens apertures and the highest ISO 12800 value on the Dash Cam market. Night video quality is currently unmatched. The OPIA Dash Cam series appeals to the majority of customers. Small, no fuss operation, discrete, premium video quality, reliable and highly rated and reviewed. 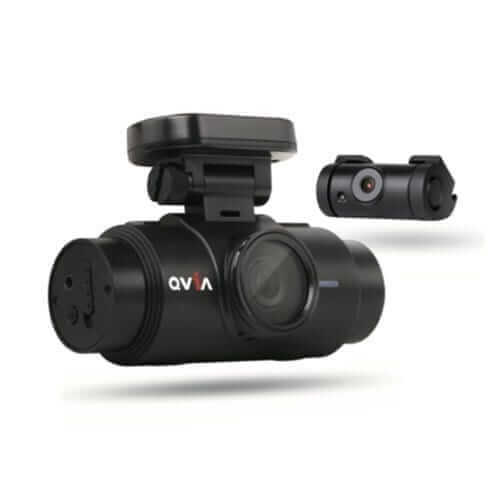 Both QVIA 2CH Dash Cams are reliable, built very well and have features and functions that you want in a Dash Cam. If you want the receiver to use the Dash Cam on Christmas Day while driving to and from a celebration, ensure you purchase a Micro SD card with the Dash Cam (unless they already come with one). That way the receiver will have everything they need to start using their Dash Cam gift straight away. If you need any further guidance please check out our other blog articles or contact us for further assistance. From the team at Dash Cams Australia – Merry Christmas and safe driving over the holiday season!